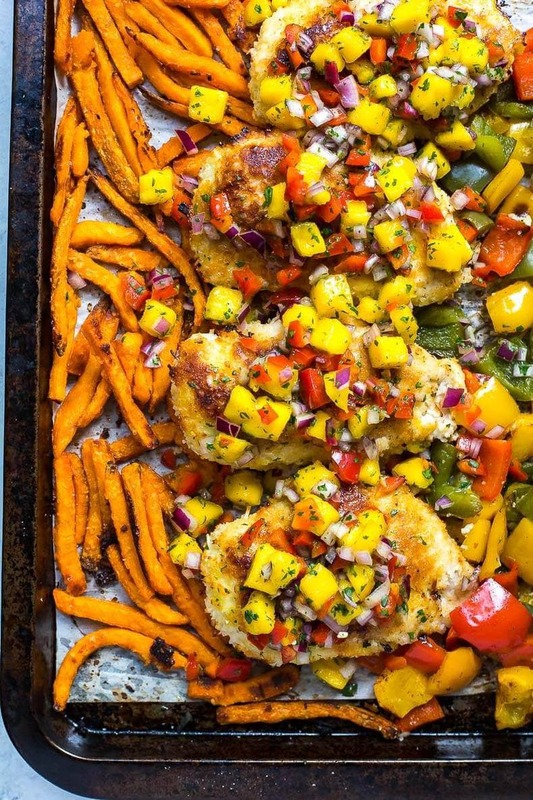 This Sheet Pan Coconut Crusted Chicken with mango salsa, bell peppers and sweet potato fries is the perfect dinner solution after a busy workday – and you can take the leftovers for lunch! Welcome to my coconut obsession. 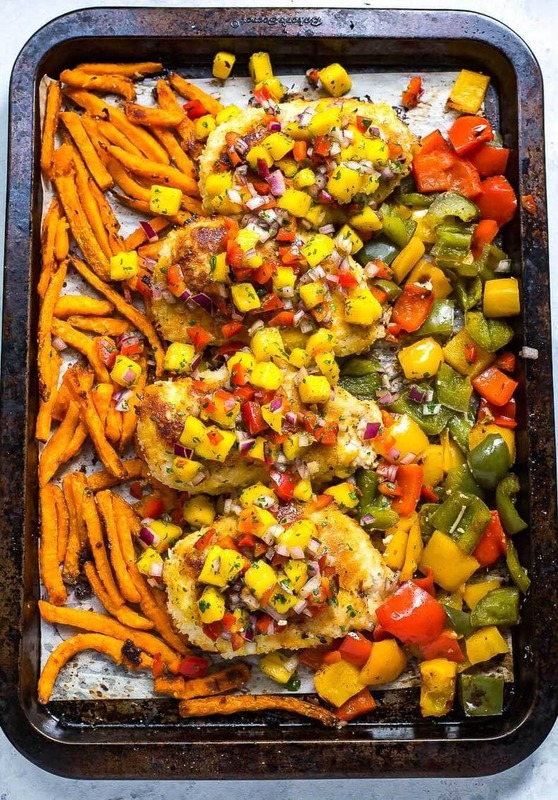 And as if all of that isn't enough, I'm coming at ya today with this vibrant, amazingly delicious Sheet Pan Coconut Crusted Chicken. As if I needed one more excuse to indulge in my favourite flavour. I mean, there's just something about coconut that screams summer. Whenever I smell coconut I automatically associate it with summer road trips, sticky hot days filled with sunscreen, sunglasses, beach days and good vibes. I just want more and more of it. Summer, please, do you. Never end. NEVER LEAVE ME! Regardless of the fabulous weather, however, I never cease my workaholic ways. In fact, just last night I was cursing myself out for working a 12 hour day trying to get everything done when it was so beautiful out. Days like that, there's no time for cooking. Enter my next best obsession, right next to coconut. 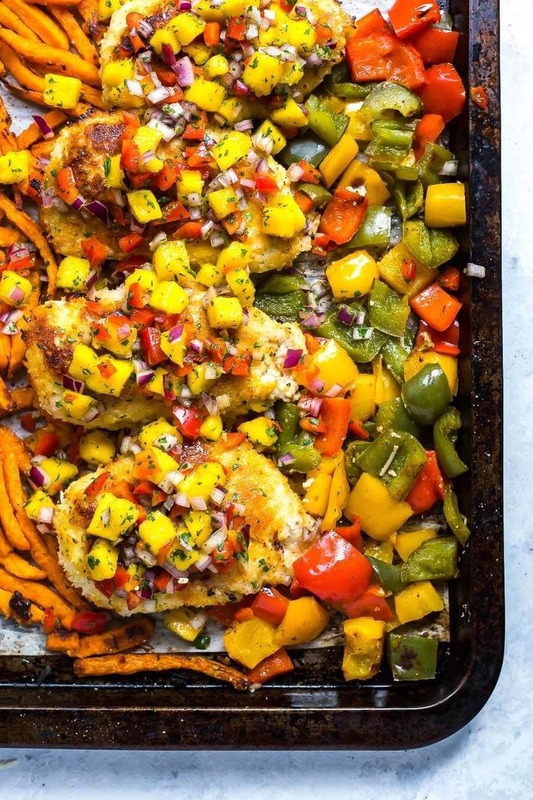 Sheet pan meals. OMG YAAAAASSSSSSS. 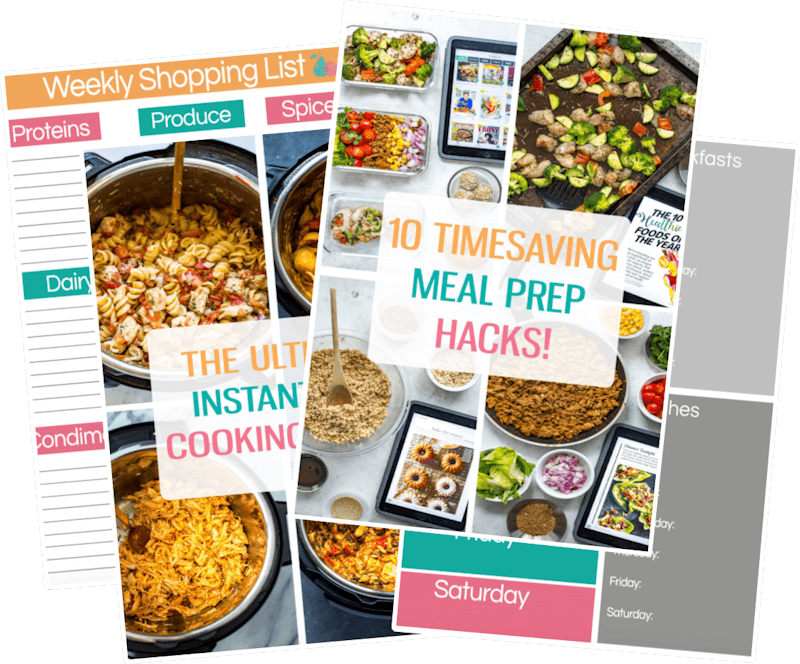 The basic idea is that you throw a bunch of tasty veggies and a protein of your choice onto a baking sheet lined with parchment paper, and let everything cook at once, usually for about 20-30 minutes. In this case, I've tossed some boneless, skinless chicken breasts in a flour-egg-shredded coconut mixture and thrown in some frozen sweet potato fries (the ones from Costco are bomb!) and some chopped up bell peppers. While all of that is cooking, the mango salsa gets mixed up. Speaking of mango salsa. I put that ish on everything. 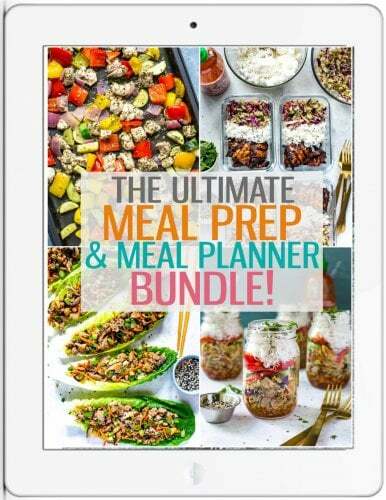 Shrimp Sushi Stacks, Meal Prep Jerk Chicken Bowls…everything. It is a totally optional component of this meal. Seriously. 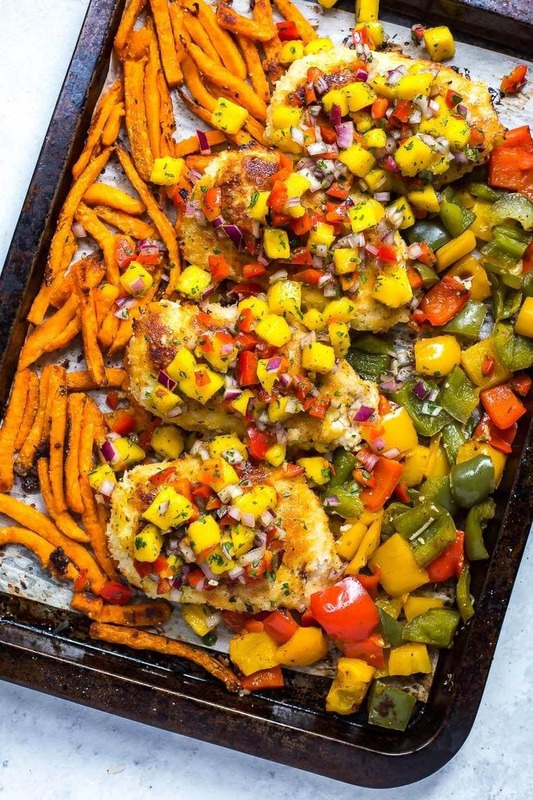 From there, once you've got everything on your oven pan, it's just a matter of baking for about 25 minutes at 425 F or until the chicken is fully cooked through. I take the bell peppers off about halfway through the cooking time (or you could add them in toward the end of the cooking time) just because I don't like mushy peppers and I find they tend to cook fast, but if you want a true sheet pan meal just throw it all in the oven and forget about it. 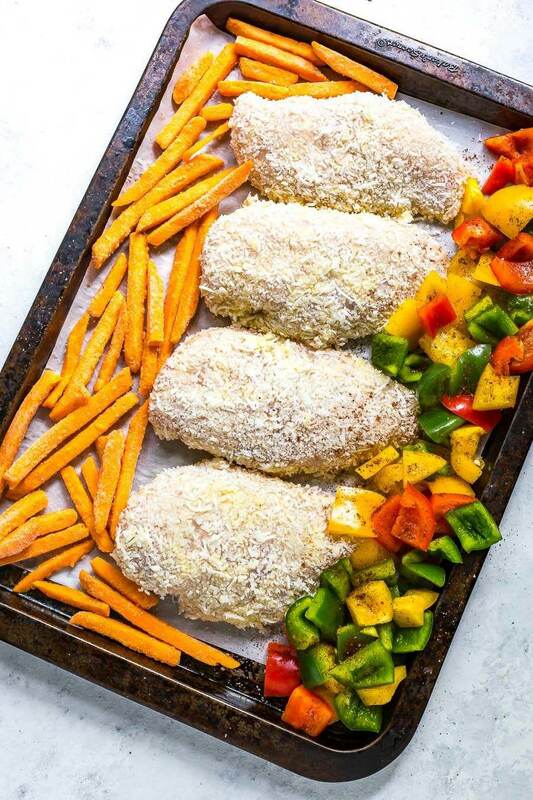 Will you be making this Sheet Pan Coconut Crusted Chicken? Despite not being a huge fan of the flavour as a kid, I think I could eat coconut all day everyday for the rest of my life and never get sick of it. My, how our tastebuds change over the years, ehh? What kinds of food did you not like as a child that you now adore as an adult? I'm interested to hear everyone's perspectives on this! 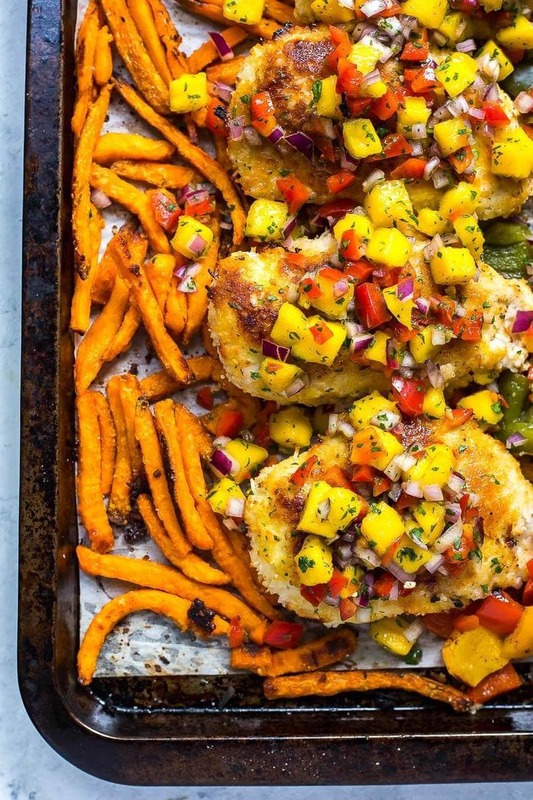 This Sheet Pan Coconut Crusted Chicken with mango salsa, bell peppers and sweet potato fries is the perfect dinner solution after a busy workday - and you can take the leftovers for lunch! Preheat oven to 425 F. Add flour, eggs and coconut to three separate bowls. Toss chicken in flour, then coat in egg. Finally, coat in coconut, covering well. Add each breast to a parchment-lined baking sheet. Add chopped bell peppers, then season peppers with a bit of chili powder. Add sweet potato fries, fitting as many as you can on the pan while making sure they remain in one layer. Season everything with a bit of salt and bake in oven for 25 min or until chicken is fully cooked. If you don't want peppers to be too mushy, either take them out halfway through the cooking time or add them in with 12 minutes left in the cooking time. While everything is cooking in the oven, make the mango salsa. This step is optional as you may just want to use the sweet chili Thai dipping sauce - that's all the chicken really needs. But if you'd like the salsa, just mix all ingredients together and set aside until the meal is finished cooking. 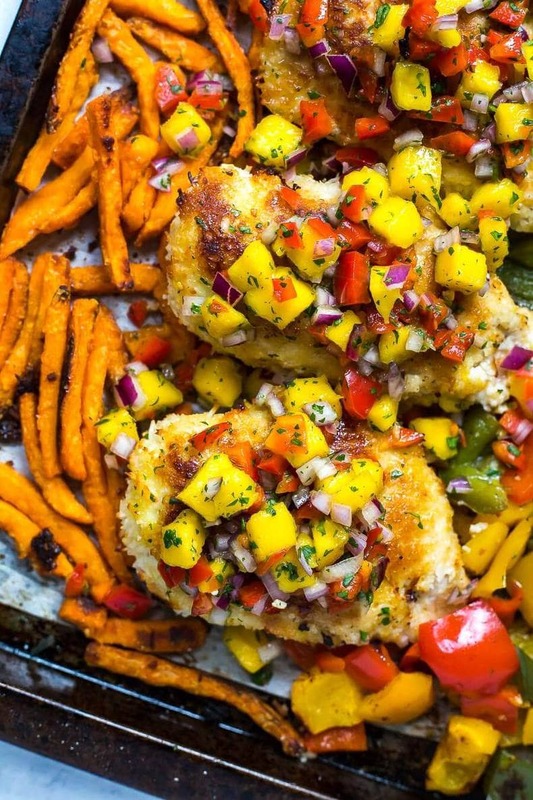 Remove everything from oven and serve with mango salsa on top and sweet chili sauce on the side. Enjoy!